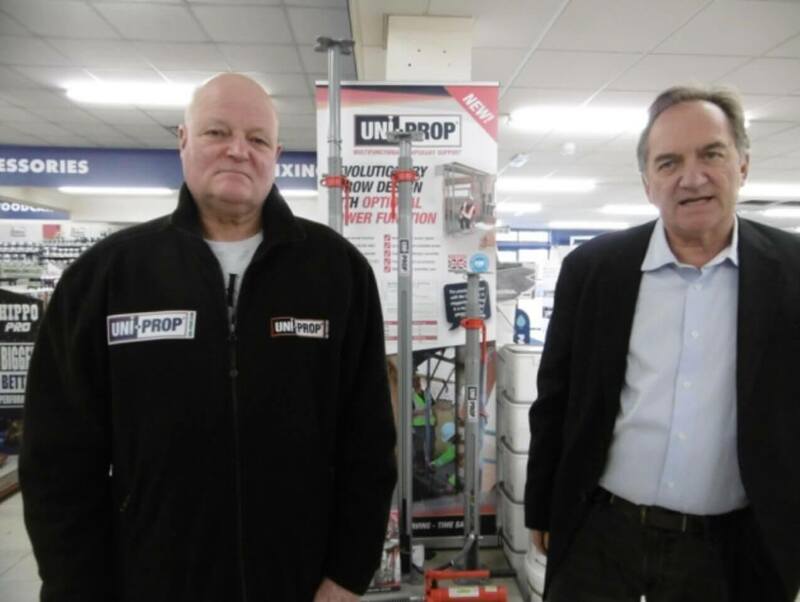 Blacksmith Tom Moye and David Marr, managing director of Uni-Prop International, with a display of the Uni-Prop system in the Jewson building supplies centre in Greyfriars Road, Ipswich. The Uni-Prop system is in the Jewson Hire catalogue for 2019. Ipswich has a long history of engineering invention and innovation. Now one local company is launching a new product for the construction industry, and it is already receiving international interest. One Ipswich company is aiming for growth this year, with its innovative building product – the Uni-Prop. Uni-Prop International has received global patents in the USA and Australia, opening the door to worldwide sales of its adjustable building support. There are other international patents pending. The device is a major development for use in the general building industry and renovation area. It is the first upgrade in steel temporary supports, commonly known as Acrows, in many years. The Acrow, invented in Switzerland, is an adjustable metal support which performs a vital role in building and renovation projects. It has been in use for more than 80 years. The Uni-Prop, developed and invented in Suffolk, is a modern, hydraulic alternative which the makers say is safer and easier to use. Sometimes, on a building site, an Acrow prop is knocked into place with a hammer and afterwards, knocked out of position in the same way. The new product has a growing client base in East Anglia and across the UK, as far away as Newcastle and Scotland. After a number of years development and prototypes, the first units were sold last year. Uni-Prop managing director David Marr said: “The Uni-Prop is safer and easy to use. “It is safer and labour saving, and time-saving. “We are very excited about it. We have had a good start. “We have a number of local building companies using it in East Anglia. And customers in Newcastle and Scotland are using them. The product is currently made in China, but there are hopes to bring some of it to the UK, at a later date, he added. Mr Marr is an entrepreneur who has been involved in a number of local businesses. And he was keen to recognise the role that Woodbridge blacksmith Tom Moye had in the product. “Tom was pivotal in terms of the concept. The Uni-Prop is a steel adjustable prop, which is placed in position and then raised using a bespoke hydraulic ram. It can be used in any building situation where temporary support is needed, One has even been used, remotely controlled, on the seabed. Although construction is the main marketplace, other potential uses are coming to light. There has already been interest from the USA in a Uni-Prop being designed for use by the emergency services. “We have also been told there is possibility of developing a version for disaster relief, in earthquake situations when buildings need temporary support. “It has great potential as a life-saving device,” he added.